Let’s set the scene. You’ve just completed a job as a customer service agent where you worked via phone support, and are in search of a new position. During your job hunt, you come across an ad that is hiring for online chat agents. You think to yourself that you will be a shoo-in for the position, as you are under the impression that phone support is the same as online chat support. So, you apply and get the job, and much to your dismay, find out that becoming a successful chat agent is an entirely different ballgame as compared to phone support. As a Team Leader I believe that new agents need advanced, in-depth training before going live. To be a successful live chat expert is not easy, there is no pinpoint factor to say “if you’re good at this, you’ll be good at live chat”. It’s a completely different form of communication. One good factor of a new agent having phone support experience is you know that they already have a customer service background. I do not think someone can go right from phone support into chat; one may have good phone skills, but suppose they have a low typing speed, they won’t get messages to customers in time. So at The Chat Shop, an applicant with customer service experience won’t necessarily be a shoo-in for the position. On a regular basis, I introduce and train agents on the equipment, tools, and knowledge needed to become an auspicious chat agent. I must ensure that the employee fully understands the ins-and-outs of our training software, Knowledge Base (KB), the different EIMs and the clients they are assigned to. It is also crucial to discuss factors such as chatting techniques, conversation styles, and all around best practices for online support, as it is more complex than customer support over the phone. There is one similarity between phone and chat support; and that is that you wouldn’t put someone on phone support without training, and you certainly shouldn’t let a chat agent go live without the proper training either. What makes chat support more in-depth than phone support? I’ll begin with the main component which is responding via text versus spoken word. It is more difficult to portray emotion through text. While chatting online, you can’t hear someone’s tone of voice, or see their facial expressions. You miss the visual input, which without the proper training; can lead to a very unsatisfied customer. With text-based communication, you get the luxury of getting to take your time with something. For example, while you’re typing you can reword your response if you think it may cause the customer a misunderstanding, but when you’re talking on the phone, you can’t change what you say; that’s certainly a forgiving element of chat. This leads me to my next point, which is providing live chat training that encourages agents to make sure their personality shines through during each chat session. People tend to think that when they use chat support, they are speaking to a robot that’s been designed to answer consumer questions based on a computer’s recognition of words or phrases stated by a customer. Here at The Chat Shop, we are far from robotic. 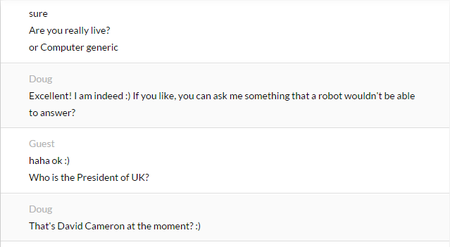 We leave the quick and simple stuff to our chatbot operations. If you’re interested in finding out more about our chatbot design, build and management programme, have a look. Aforementioned, we stress the significance of building a relationship at the onset of chat. If a customer asks, “Are you a robot?” I like to tell my agents to respectively freestyle it, or say “Ask me a question and I’ll prove it”. This way, the customer gets a response that couldn’t possibly be generated by a computer. In addition, I advise agents to try to reflect the customer’s tone of chat; e.g. if the customer seems to chat in a formal manner, be more formal with them. If the customer is more friendly and smiley, mirror their tone. Online chat has an agent ready and waiting for a customer’s request, which is one of the main benefits on chat support. Straight away, a customer is able to get free instant responses; as opposed to calling into customer support where a customer will be placed on hold, transferred to another department, and unaware of any costs. The Chat Shop does not put customers on hold and queues are uncommon. To become a live chat expert here at The Chat Shop, you must go through rigorous live chat training whether you have worked in customer service before or not. All agents get the same training as everyone else, which consists of at least 100 hours of paid training, usually spread over 3 to 4 weeks to help them digest everything. We take them back to the basics all the way through to hammering away at 3+ concurrent chats, with 32 second average response times. This is completely different from an individual phone call, or messaging your friends on WhatsApp. As a Team Leader, my role in training is mainly based on teaching the agent about the clients that are assigned to that team. The agent and I do this by looking at client knowledge (KB and the client site) and working through clients 1 by 1. We start the initial training with a call where I introduce myself and brief the agent on the setup and structure of the team that the agent is assigned to. I also explain what tools we use, terms (e.g. EIM, KB), overall approach to chat and provide a little more information on our company. The next phone call is where the agent and I go over who the client is, what they provide, and then work through the KB where we have all pertinent information. After that, the agent will complete training software by taking surveys with multi-choice/true and false questions, followed by a final test with in-depth written answers. I review the agent’s answers and they must score 100% on all tests before they are able to start chatting to any website visitors. Next, they go to test chats where I roleplay a customer engaging on chat – we practice conversations that touch on things the agent will have to deal with during their shift. It’s one thing knowing information, but another using it in context and in a scenario. Following test chats, the agent goes live with one client, usually with one chat at a time. During this period, the Team Leader monitors chats (providing help if needed). Once they prove they have mastered their chat skills and client knowledge, the agent moves to 2 chats, then 3. After this happens, we start the process all over again by adding more clients. Once the agent has fully succeeded these processes with all of the clients, they go live with the full team. There is no set time frame as to how long the training process will take, as it’s dependent on how the agent is progressing. When the agent achieves 100% on tests and the Team Leader is confident in their performance, they can go live. If they don’t seem confident enough then we might do more test chats or training. Typically, training takes a dedicated 3-4 weeks. After this 3-4 week period is over, there is still ongoing training. We need to keep our agents as up to date as possible on their clients and new ways for us to better serve their website visitors. Agents must also complete our in-depth Quality Assurance process every week. This is where the agent and Team Leader assess a cross-section of chats to see how effective they were in achieving a number of chat goals. The training software is also reset regularly to make sure agents are up to date on the latest client information. Any updates from clients are disseminated to agents as soon as they come in – so that they always have accurate knowledge to use in chat. A key quality aspect that I monitor once an agent has gone live is their knowledge; ensuring the information the agent is providing to customers is accurate and up to date (as information does change). Following knowledge, I monitor response times; we have a target of 40 seconds for first response and average responses. Our averages are actually far shorter than that. We provide high quality first time responses and average responses in 30 seconds. That’s the best response times, coupled with the highest satisfaction rates, in our industry. If agents are struggling with anything, I speak to them and provide suggestions on how to improve. Next is tone of voice; ensuring agents are coming across the right way on chat. As mentioned before, the customer can’t hear or see the agent, so the written communication must be great. We must have a positive tone throughout the chat, so that we can build relationships with website visitors. Also, I make sure tags are correct. We tag chats in order to provide in-depth reporting to clients – what are the trends in their website traffic and chat conversations? To carry out accurate analysis it is important that agents tag all chats correctly. As you can see, there are sizable differences between different customer support communication channels. Becoming a live chat expert requires as much (maybe even more) training and preparation as phone support. Along with superior live chat training, we screen our agents’ chat personality before they are even hired – the first interview is through live chat. This gives us the opportunity to see how well they communicate before they receive any training. The most important thing to remember as a Live Chat Expert is that you have to allow the customer you’re speaking with to know that you are a real live human, with a sincere desire to assist them in any way possible. Tone, personality and emotion are not easily conveyed via text. Our agents need to help the customer whilst providing a great brand experience. Not that phone support isn’t a hard task, however, chat support takes a skill that not everyone possesses. It’s not an easy job, but someone has to do it! Alongside providing live chat training to our own experts, we also provide live chat training as part of our live chat consulting services. Help your in-house team get the most out of live chat with our live chat training services.